I know–you just finished cleaning all of the pans from Thanksgiving Dinner and here I am talking about Holiday Program Decor…yep! I’ll be prepping for my Holiday performance in that’s in 2 weeks and so I thought I’d share some of my decor discoveries. My programs include songs to represent Hanukkah, Kwanzaa and other multi-cultural holidays. This year we’re closing the program by singing “Just Believe” from the movie “Polar Express”. I found the background tracks at KARAOKE-VERSION.com I guess that’s why snow seems to be on my mind-especially since there isn’t any in the Phoenix area. I selected these ideas mainly because I can make most of the props using the materials at the school. Although I have used ORIENTAL TRADING company for props. 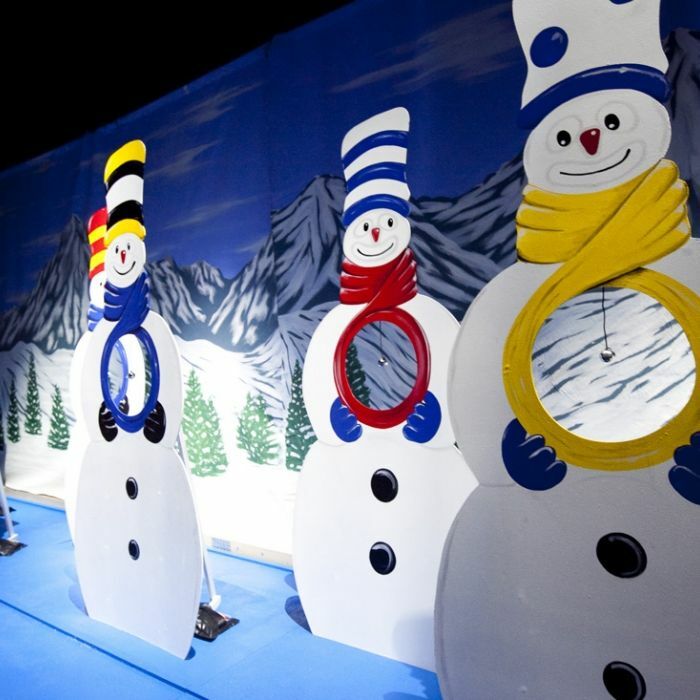 In the picture below I can see that they used the $1.00 table cloths from a dollar store for the blue background and dixie cups for the snowman. I have a small budget, so I’d be able to pull off this idea pretty easily. 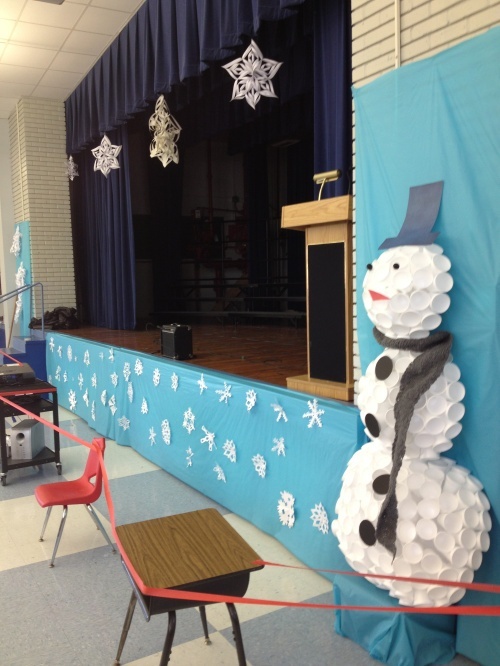 I could even have my Chorus students come in during lunch time and make snowflakes to hang from the ceiling of the stage. Mine isn’t quite like this one-we have steps leading up to the stage-but it’s similar. Easy and Frugal-my two favorite words when it comes to decor. 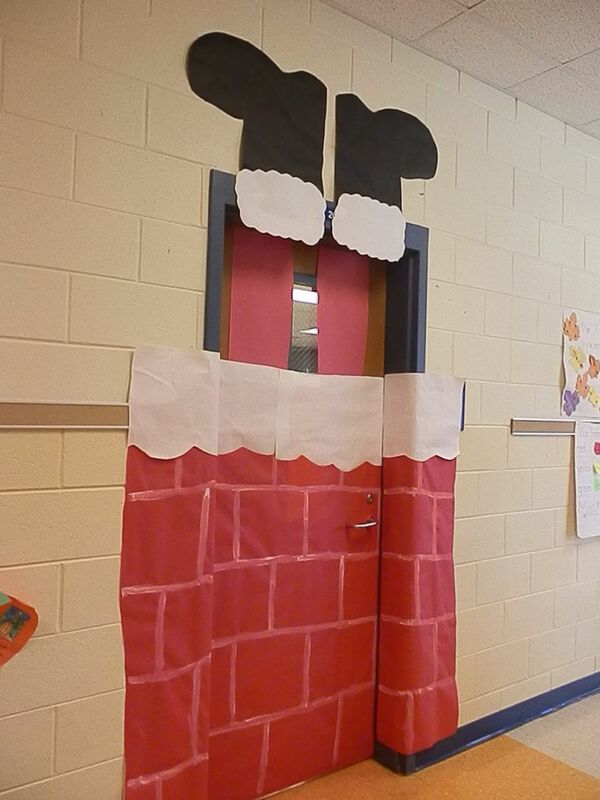 Here’s another cute idea-and one that I could get my students to do without too much help. It appears to be nylon string threaded through cotton balls. I love using unusual things to make decorations. 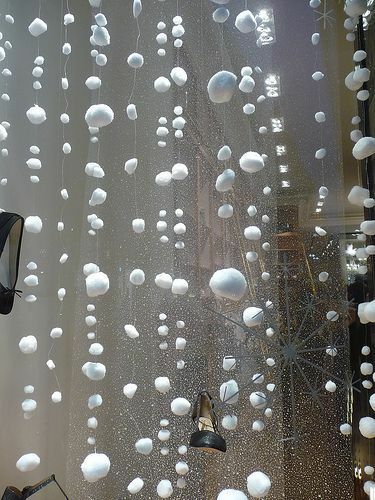 These are fabric trees with lights beamed up on them to create the glow. I absolutely love this next decor idea. I love lights! 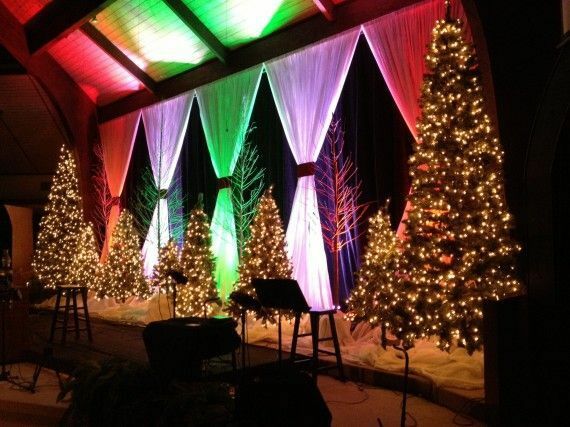 I’m thinking that I could limit the trees to just one in the corner as my students would fill in the whole stage. I wouldn’t need the background trees as the kids would cover them up…but I love the idea of hanging the white fabric from the ceiling and using a simple ribbon tie to give the appearance of windows. I have colored lights already-and a couple of white sheets that would probably do the trick. I’ve purchased the twin white sheets at Walmart for around $5.00 and used them for a lot of different things in my classroom. I can really visualize this on my stage and I know my kids would go ooooh! when they saw it. Although snowmen don’t fit into my theme this year-I think they are adorable. They are also something you could use every year. I’m sure you could make some out of big cardboard boxes or poster board. The backdrop is painted on fabric. That’s a great idea because you can fold and put the background away in your cupboard for the next year. 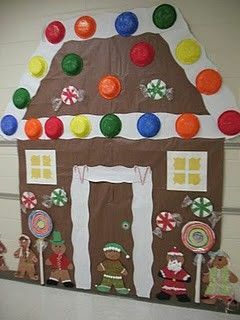 How about a Gingerbread house? We’re also performing “MUST BE SANTA”. The girls will sing and the boys will echo. The boys will have a special dance they do during the refrain as the girls sing the song. Here’s a decor idea that might work well for that song. Searching for some cute decor ideas has really helped figure out what I might do this year for my stage decor. I’ll be sure to take a picture and share it with you! What ideas do you have that you could share?